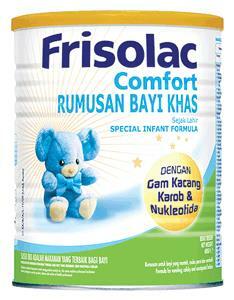 Frisolac Comfort is especially for babies with minor digestive problems such as vomiting, colic & constipation. Frisolac Comfort is a balanced formula containing a range of essential nutrients. It contains: \u2022	Linoleic acid \u2022	5 types of nucleotides Frisolac Comfort is specially formulated with carob bean gum, a fibre with its thickening properties to provide relief for the following symptoms \u2013 infant regurgitation, constipation and colic pains. It can be used for babies suffering such symptoms from birth onwards.